Pedal to the river, grab a kayak. Spend the day paddling downstream. Then hop out, grab a different bike, and ride home. 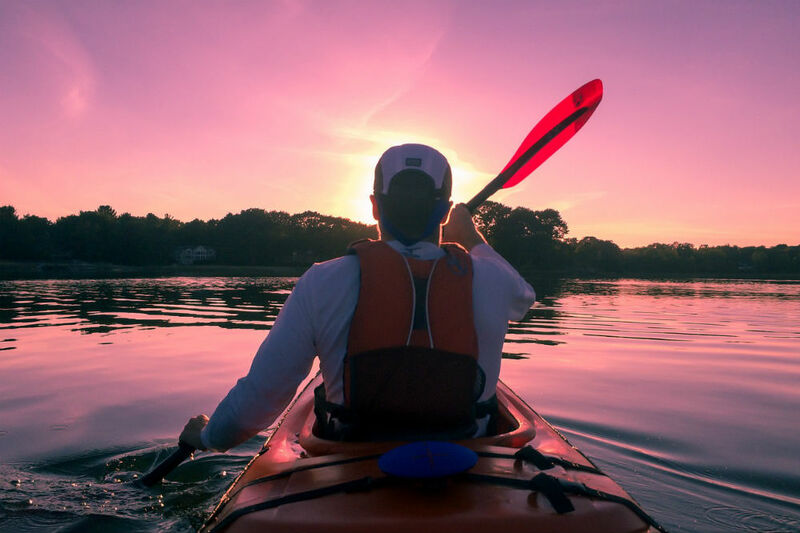 That’s the vision of the National Park Service’s first ‘kayak share’ initiative. A pilot program launching this month, the Mississippi River Paddle Share will give people in the Twin Cities a four-mile stretch of urban river to paddle in a day-use kayak. The NPS purchased 32 single-passenger Current Designs Solara 120 kayaks. They will be on the water at the end of August. An example of what the Paddle Share kayak lockers will look like. 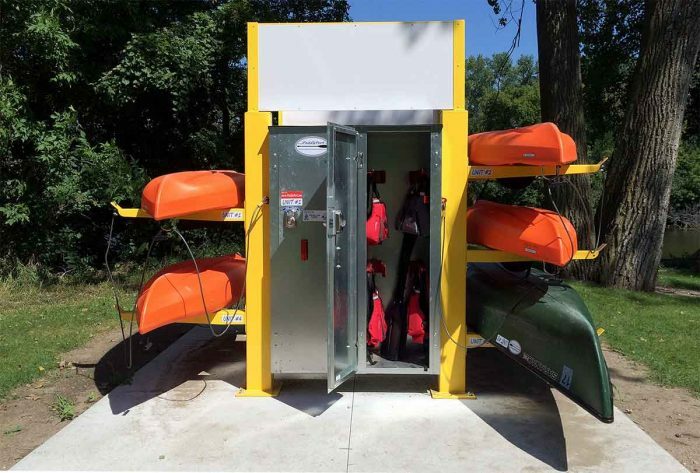 This model, currently installed in Albert Lea, Minn., holds six kayaks, while the Paddle share racks will accommodate eight. Overson is referring to Minneapolis’s bike share, Nice Ride, and the recent boom of similar systems around the country. If her project does for kayaks what public-use programs have done for bikes, you might soon be able to reserve a kayak along other scenic rivers in national parks and drop them off at a station downstream. That’s what sets Paddle Share apart from existing kayak and canoe rental spots along the Mississippi and elsewhere. Users will be free to paddle as much or as little as they want, take out at a bike and paddle station, and bike home. No car or guide required. Unlike bike shares, however, the costs of a day-use kayak are not as cheap compared to their rental counterparts as bikes are. For its first season, Paddle Share will charge $30 for 4-hour use, and $60 for the whole day (10 hours). Rentals are made online and include kayak, paddle, and personal flotation device (life jacket). Paddlers must be 18 years or older to reserve. 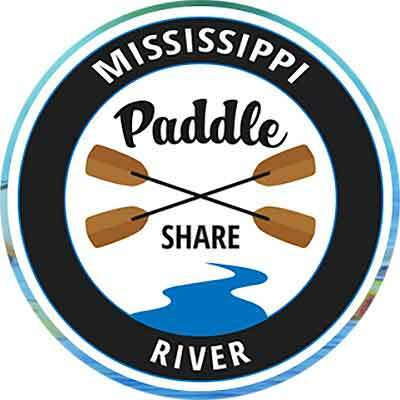 For its first year, the Paddle Share program will have two put-in locations, the North Mississippi Regional Park, and the Mississippi Watershed Management Organization Stormwater Park and Learning Center. All paddlers will take out at Boom Island Park, 3.9 miles downstream. The $215,000 pilot program was funded by grants from the NPS Transportation Program and REI. 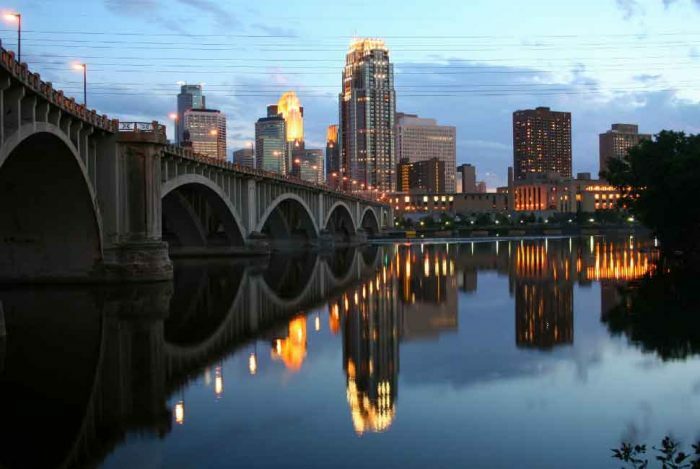 The Mississippi National River and Recreation Area comprises a 72-mile stretch of public water from the northern suburbs of Minneapolis and St. Paul down to the confluence with the St. Croix River on the Wisconsin border. Overson said she is already receiving inquiries from counties bordering the waterway about opening future stations.